Ask fellow campers about "Robert Newlon Airpark RV Park" and nearby attractions. We stay here every year traveling south. It can be wet around the sites but they have improved the pads by adding new gravel and to the roads. A lot less monthly campers too. There is a train track right next to the camp ground and trains run through at least 1 or 2/night. But we can't say enough good things about the manager. We pulled in with what ended up being being a minor problem with our truck. She pulled out her phone, made a call and got us to a great mechanic right near-by. Good to know people still care. We camped at Robert Newlon Airpark RV Park in a Fifth Wheel. Go to The Fly In Cafe which is in the park. A local bar/grill. Great seafood and friendly staff. In the winter it's only open Thurs-Sun. West Virginia is a challenge as far as RV parks go and this was on exception. This is a small, very cramped RV Park with mostly long term. The park is sandwiched between a railroad track and the grass runway strip. Yes, you can hear the train - it is literally right in front of the park. The sites are very close together. It had been raining for days so all the sites had inches of water and were very muddy. We had asked for a pull thru so we wouldn't have to unhook the toad. We were originally assigned site 2. There was no way we could get into it with a 45 MH and tow vehicle. We had to skirt the eaves of a building, make a quick left and then another quick left to get into site 2. We saw that site 4 was empty and called to see if we could use it. The answer was no someone else was assigned to that site. So we weaved back around around the tiny, cramped park dodging (by inches at times) the multiple vehicles parked everywhere. In the pouring rain, we unhooked the car. During the process, we were approached by the owner. He sensed we were having problems, and he made a call and got us into site 4. Thank you! The WiFi did not work. They were supposed to bring us a receipt when we arrived but they never did. Other than the air park, there is no appeal to this park. It is definitely not a place suited for big rigs especially as they allow people to park their vehicles anywhere. We won't return. We camped at Robert Newlon Airpark RV Park in a Motorhome. Easy to get in and out. Pull thru sites. Very friendly people. Have to cross airstrip to get to river. Restaurant is only opened Wed-Sun for dinner only. Food was good. People were great. They were working on the building so bathrooms/showers were not accessible while we were there. Would go back again. Limited hours in the office, but always available by phone. 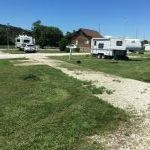 We camped at Robert Newlon Airpark RV Park in a Fifth Wheel. Nothing special good place for just one night. It has no shade and all places very close to each other. Close to the train but it is quiet at night. Good WiFi. We camped at Robert Newlon Airpark RV Park in a Motorhome. Stayed here one night as we traveled west to east. Not a lot to pick from in this part of the country for a 45' MH. This one was easy to get to but very muddy when we got there. Clearly they are working on it but was pretty cut up. My coach would not connect to 50A in site 4. I kept getting the dreaded neutral not equal to ground error. I tested with my multimeter but couldn't find the problem. A guy came out with his multimeter and when I asked if he was an electrician he said he was the electrician for this park. At any rate, they had just pulled wires for these 50 amps. My coach has hooked up no problem to 50A everywhere else ever since. Be VERY careful. 30Amp hooked up fine which was ok as we were only there for one night. Which was our last night! We camped at Robert Newlon Airpark RV Park in a Motorhome. Like others have described, the location made it an ideal spot for an overnight. The airstrip and surrounds are near the Ohio River and it would have been entertaining if there were planes landing or skydiving lessons happening..... The park is really a few lines of sites; nothing special or appealing. The restaurant was a pleasant surprise. We camped at Robert Newlon Airpark RV Park in a Motorhome. Needed a quick overnight place. Many long term residents, but quiet and clean. Good restaurant on site and would probably be real fun when people are jumping. We camped at Robert Newlon Airpark RV Park in a Motorhome. This park is a great idea but unfortunately needs a lot of work. The positive sides are: it's connected to an airstrip so there is lots of entertainment involving that and there is a top notch seafood restaurant in the park that's open Thursday through Sunday. The train that runs right next to the park wasn't an issue. The negatives are: the park manager has another job and isn't always available, many of the sites are soggy and the interior roads are full of potholes. This park needs some TLC. I believe it's owned by the county so that may be a factor. We camped at Robert Newlon Airpark RV Park in a Fifth Wheel. Great area, right next to Ohio River. Lovely view and trains were not a bother.If they only would mow the lawns! High grass and weeds made it difficult to walk dogs and sit outside. Sites very unlevel and sewer way to far back. 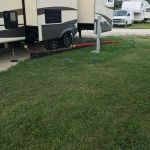 We camped at Robert Newlon Airpark RV Park in a Fifth Wheel. 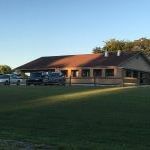 This RV park is an interesting combination of RV sites, private airport and the West Virginia Sky Diving Club. RV sites were very basic, gravel pads. The hookups were conveniently located. Roads were gravel and easy to navigate. The pull-through site was long enough for our 40 foot coach but parking for our tow vehicle (Chevy Silverado) would have been a challenge if the park had been full. Verizon Cell service was great. Satellite reception for DirecTV was also good. There is a bar/restaurant on site with an interesting airport motif and good food. The staff was very pleasant to work with and enthusiastic about their operation. 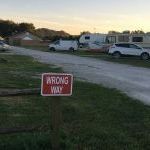 It was fine for us as a two night stay but it is not what we look for in an RV park. For small plane lovers and sky divers it would be great. We camped at Robert Newlon Airpark RV Park in a Motorhome. We visited nearby Point Pleasant West Virginia to see the Mothman Museum and statue. Don't miss Hillbilly Hotdogs on Rte 2. Great for overnight, easy on and off I-64. There is a train next to campground and can wake you up at night. We camped at Robert Newlon Airpark RV Park in a Motorhome. Overnight stop for us on a Sunday so the Airpark and cafe were both busy with planes and diners. I called for availability the day before and the lady took my credit card info over the phone to hold our reservations. So they do take credit in addition to cash and checks. She gave us our site number and directions to our site including telling us to go into a lane that says "wrong way." I don't know why the sign is there since that's truly the only way to get to our site. There was never anyone in the office to check us in so we just parked. Our credit card was charged the next day. All sites are pull thru. Ours was barely long enough to fit our 40' motorhome and towed, but it was level. The sewer is way way in the back. You need at least 30' of hose to reach it. No wifi or cable. No shade. No pool or playground. No off leash dog park. The restrooms and bathhouse are in the cafe building. A train passes by at least twice a day. The 50 amp sites are next to the tracks. The 30 amp sites are further away from the tracks but closer to the cafe and showers. Nice little park. Great for an overnight. We camped at Robert Newlon Airpark RV Park in a Motorhome. Memorial Day weekend. Lots of stuff going on. Watched several sky divers and people flying motorized aerial devices, don't know how to describe them. Ate at the restaurant, good value. Staff was friendly, yes hard to find. The only time I saw the lady who took my reservations was in the restaurant she was the hostess. Sites are a little tight and unlevel but they work. We camped at Robert Newlon Airpark RV Park in a Motorhome. The word for this park is eclectic. It is an airport with a skydive outfit with an airport restaurant which used some unused space between the railroad tracks and the airport for put in 30 FHU sites for RVs. There are not a lot of sites for transients, there is no one at the office Monday-Thursday and there is no one on the property during the day. Most sites are 30 amp. I'm sure this would be a different experience on the weekend when there is activity at the airport. I spoke with the park owner over the phone, was assigned a site which was occupied when I arrived. Another call got me another site. She said she usually got to the property around 5pm but I didn't see anyone by 9pm so I tucked the overnight fee into an envelope and put it in the mail slot at the office. The instructions at the office were to fill out a registration card, but the only thing at the desk outside the locked office was envelopes for money. I did speak to someone at the cafe that said the owner would probably show up that evening to mow grass and fly one of his planes, but that didn't happen either. If you're a pilot and you like trains and you're going through here on a weekend, stop. Otherwise, keep going. We camped at Robert Newlon Airpark RV Park in a Motorhome. Coming from the west on I-64, the GPS tries to take you through Huntington. Ignore these instructions and continue onto exit 18/Rt 193. 4 lane divided highway goes almost directly to the airpark. We stayed here while visiting our daughter for a week. It is convenient to fuel, grocery and shopping at the mall. We called to reserve a spot and the gentleman on the phone gave us a choice to pick from. The sites were level and gravel and full hook-up was available. The wi-fi never worked while we were there and even after notification was not fixed (only reason for the lower rating). No one was ever in the office and I wrote a check and placed in the envelope in the office door (same as the registration slip). The Fly-IN cafe was a great bonus and open on the weekends with excellent food and drink. This is the most convenient campground if staying in the Huntington, WV, Chesapeake/South Point, OH area. We plan to stay here again in the spring. We camped at Robert Newlon Airpark RV Park in a Motorhome. The Huntington Mall is very close as well as the Merritt Creek Shopping Center. Are you affiliated with Robert Newlon Airpark RV Park ?